Fantastic food is at the heart of our hospitality. From rabbit lasagne to sausages and mash, our expert chefs create seasonal menus using the best local ingredients and vegetables picked from our own walled garden. From big breakfasts, leisurely lunches and afternoon tea to family dinners and adult dining, we offer flexible eating options. Tuck into antipasto platters, steaks and classic seafood in the Conservatory, while the kids devour Dingley Dell chipolatas or ‘hidden vegetable’ lasagne. 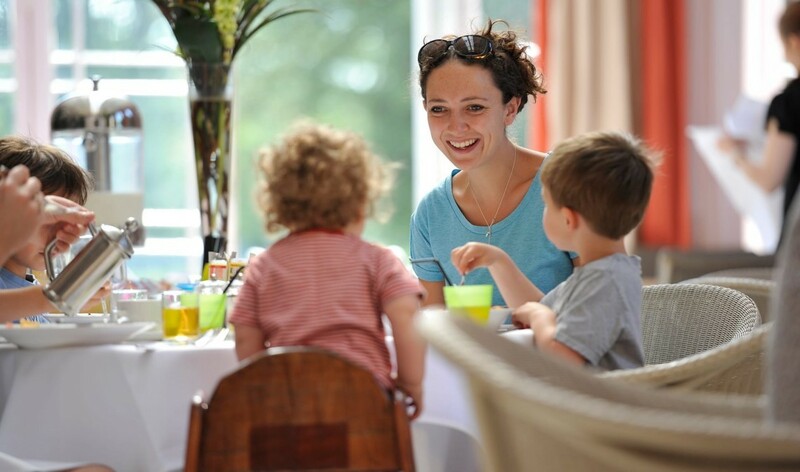 Or put the children to bed (If you are staying in the hotel switch on the baby-listening system, or we can organise a baby-sitter if you are staying in the Lodge) and enjoy a sophisticated, adult-only dinner in Frederick’s restaurant, overlooking the Italianate gardens. A breakfast buffet is served at weekends and for guests dining in the hotel you’re also welcome to order from the breakfast menu. We make family meal times easy and convenient, with menus geared-up for children: whether they favour mocktails and macaroni cheese or boiled eggs and burgers. Kids’ meals and light snacks are served from 12pm to 8.30pm, and you are welcome to have meals delivered to your room. Our chef will also provide fresh, pureed baby food from 7am to 10pm. Our delicious afternoon tea is served from 12noon to 4.30pm Monday to Friday, and from 2pm to 4.30pm on Saturday and Sunday, with a children’s option available. Children’s ‘High Tea’ is served in the Cinema Room between 5pm and 6pm. With the children safely tucked up in bed, take a table overlooking the Italianate gardens and dine by candlelight in Frederick’s Restaurant. Sample cuisine based on seasonal ingredients from local and artisan suppliers, sip vintages recommended by our expert sommelier, and catch up on some well-deserved time as a couple. Enjoy a classic afternoon tea in the elegant surrounds of The Ickworth, following in the footsteps of the English gentry before you.